When you and your chainsaw have work to do, you want to hear lots of noise and see sawdust fly. The last thing you want is a chainsaw that is running poorly or not starting at all even with these nice fall temperatures we’ve been having. Extreme heat and cold can just add to the problems. Here are three cost-effective product suggestions that can not only make your saw more reliable, it can dramatically improve its performance and output. After proving the value of this trio of products in your saw I expect they will be part of your regimen for good. AMSOIL Saber Pro Premix is a commercial-grade 2-cycle oil that delivers top-notch performance and protection. 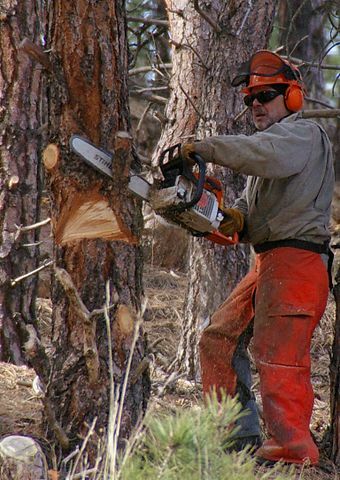 Allowing your chainsaws to perform at their best everyday and last longer too. This 100% synthetic premix can safely be mixed at ratios from 60:1 to 75:1 for commercial use and pushed to the limit all day long. You can use one mix of Saber Pro in your entire two-stroke fleet with outstanding results. This has been proven in engines with OEM mix ratios from 16:1 to 100:1. With Saber Pro, there is no need to keep multiple two-stroke fuel batches around. Bar and chain oils from many brands tend to be poorly made and this is often reflected in their performance. As with all AMSOIL products — this oil was not an afterthought but a sophisticated lubricant that is designed to improve operation. The tacky semi-syn chain oil is loaded with anti-wear and friction reducing additives to improve cutting performance and reduce chain wear. The synthetic component allows it to perform consistently in extreme heat or bitter cold. A critical aspect of small engine performance is the fuel system. If the fuel system is not healthy starting is an exercise in frustration and engine performance is compromised. Just a tiny dose of AMSOIL Quickshot promotes reliable starting and optimum power delivery on several fronts. Ethanol in the gasoline tends to mix with moisture and create a lean condition. Quickshot also sends this mix though the engine without harm by keeping the moisture in small droplets instead of large clumps that drop to the bottom of the tank. Use non-ethanol, premium gasoline in all two-stroke gas mixtures. Regular and mid-grade gasoline contains ethanol and it is no friend of any small engine. As mentioned, it tends to absorb moisture and this can create a dangerously lean situation. Many chainsaws call for premium gas but be sure to inquire with the operator or inspect the pump signage to ensure that no ethanol is present in the fuel and eliminate that hazard. The hose and plumbing in a gas station pump can hold 5L of fuel or more – the fuel in those lines is whatever the previous user selected. Pump those first 5L or more into your vehicle then fill your gas can.